Looking forward to this unexpected surprise! Curious to read the new tales and see what was happening in Alyssa's first happy ever after! I probably should start this series. One day. I also need to begin this series. Too bad the day has so few hours! YES! I need this pretty, pretty book for my shelves! Great pick! YESSS! So excited about this one, and sooo in love with the gorgeous coverrrr!! Great pick Jessica! Interesting idea, I read the first two books of the series, but for some reason I missed book three. Hope you enjoy it! I haven't read this series yet. I do have the first one, though. And I love the covers! Great pick, hope you get a chance to read it soon. Great pick! I'm so excited for this book, even though I've already read Moth in the Mirror. Less than two months! I haven't read any of this series, but I hope you enjoy reading this book! Ahhh, this series. I've all but given up on the series. I haven't read Ensnared yet but I don't know if I want to! I hope you enjoy it when you read it! love this cover and i am so behind on this series. Nice pick! I'm very curious about this series! I actually haven't started this series yet (I have the first book on my shelves tho!). I'm sure I'll get to it at some point haha. Hope you enjoy it! I need to start the Splintered series! Each book has such a beautiful cover! 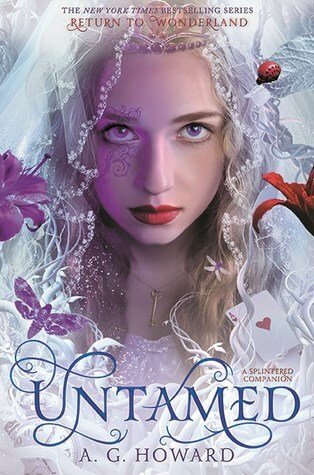 I have only read Splintered, and I had no idea there would be yet another book being released, Jessica! I agree with Naomi, the covers are works of art! Lol Yes, we may have shared a book with the same title but the subjects are completely different and I'm intrigued by this one, too! I'm still working on this series! I have all the audiobooks! Hope you get it when it releases! I really need to read this series! Thanks for stopping by my blog! I still have to read Ensnared but I am so excited for this one too! I love this series! Great pick!! And that is a gorgeous cover. Nice. The cover is way prettier than the first one. I need to catch up on this series! I absolutely loved Splintered one so I'm sure I'd enjoy the rest of the series. I hope you love this when it releases, Jessica! Stacking the Shelves--2 Weeks of Awesomeness! !